If you have been reading my blog or watching my You tube channel for a while now you will know I absolutely love the website Look Fantastic, I buy almost all my skin care and hair care from there and am always mentioning the site in my video's especially haul video's because I get most of my beauty products from there. Recently Look Fantastic tweeted asking for people to email them if you would like to write a guest post for their blog, I emailed, but thought because I am still fairly new to blogging that I wouldn't be accepted. 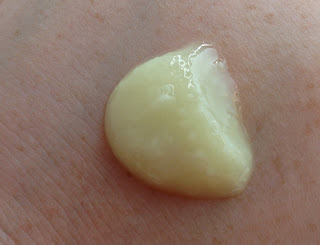 However, a couple of weeks ago I received a lovely email from a lady at Look Fantastic, not offering for me to guest post but even better than that, to say she loved my blog and that Look Fantastic wanted to work with me and that they thought I would be a great asset to their blogging community and would like me to review the products they sell on their web site. I was absolutely thrilled as you can imagine, I never dreamed I would be accepted to write a guest post so being asked to work with Look Fantastic and review their products was a massive honour for me and I am very grateful. review, but also 6 sample size products, some single use samples and some larger samples. I decided I would use the single use samples to write first impression blog posts, I enjoy reading first impression posts and hope you will too. The first single use sample I am going to tell you about is the Eve Lom Cleanser*, probably one of the most talked about cleansers in the beauty world and quoted by Vogue to be "probably the best cleanser in the world"
I applied the cleanser all over my face and then followed the instructions on the back of the sachet which were to run the muslin cloth under hot water and place over my face three times, I did this as insructed and then removed the cleanser with the cloth folded over as the instuctions stated. The cleanser is a balmy/oily texture with little beads for exfoliation, I have very dry and sensitive/eczema prone skin and I didn't experience any stinging when using the cleanser. The cleanser left my skin feeling soft and silky and hydrated, I have very dry skin and it didn't feel at all tight after using the cleanser. There are many products available in the Eve Lom Skin Care range from cuticle cream to spot treatment with many great products inbetween, I will definitely be checking out the other products in the range. The Eve Lom cleanser comes in different sizes including the 100ml cleanser including 3 muslin cloths rrp £69, or 100ml cleanser without the muslin cloths rrp £55, 200ml rrp £85 without the muslin cloths or 200ml including 3 muslin cloths rrp £99 the muslin cloths are available to buy alone rrp £14. The cleanser is suitable for all skin types and used with the muslin cloth included is said to remove even the most stubborn make up whilst decongesting, exfoliating and toning the skin. It contains clove oil with purifying properties to encourage clear skin, eucalyptus oil helps to drain away toxins whilst hops oil tones the skin, and Egyptian chamomile oil and cocoa butter soften and condition the skin. There are many products in the Eve Lom range, if you use some of the other Eve Lom products but haven't yet tried the cleanser, Look Fantastic have a brilliant offer on at the moment, and if you spend £30 on any Eve Lom products you will receive a free sample of the cleanser and a muslin cloth, this is an ideal way to try the cleanser if you haven't already but use some of the other Eve Lom products, also free next day delivery is available when spending over £45 which is also amazing, I love offers that include free next day delivery as I am very impatient and when I have ordered something online I can't wait for it to come. 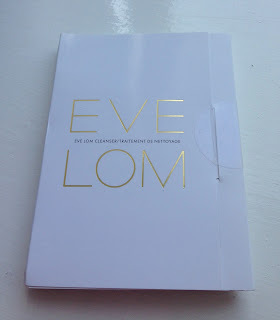 Over all I have good first impressions of the Eve Lom cleanser, my skin felt lovely after using it and I haven't had any sort of reaction either, and my skin is extremely sensitive and has been known to react to many skin care products. Have you used the Look Fantastic website? Or are you like me and have it listed on your favourites so you can just nip over and browse or in my case buy. Have you tried the Eve Lom cleanser? What were/are your thoughts?